Last week I was in Cleveland for the forty-third Anthony Boucher Memorial World Mystery Convention, or (as everyone knows it) Bouchercon. I imagine most readers of this blog are already familiar with Bouchercon, the yearly gathering of mystery fans, writers, publishers, and critics, each time in a different host city; but many will not know that Anthony Boucher, born William Anthony Parker White, had several important connections to Ellery Queen and Ellery Queen’s Mystery Magazine. Boucher had already written several short stories that appeared in early issues of EQMM before he was asked, in 1945, to take over the plotting for The Adventures of Ellery Queen radio series. In the partnership that was Ellery Queen, Frederic Dannay had always been responsible for the plotting and his cousin Manfred B. Lee for the writing of the novels, stories, and scripts they produced under the Queen byline. But in 1945, Fred Dannay was unable to keep up with the workload of weekly scripts together with his many other commitments. Boucher stepped in and plotted close to 100 scripts for the series. During that same period of time Boucher was reviewing mysteries for the San Francisco Chronicle. Later, he became an important reviewer for the New York Times, and, yes, for EQMM. Boucher’s many other talents included editing, and he was at least as influential in the science fiction field, where he co-founded The Magazine of Fantasy and Science Fiction, as he was in mystery. But where he shone perhaps most brightly for EQMM was as a translator. It was Boucher who submitted to Fred Dannay the first English translation of the work of the great Argentine writer Jorge Luis Borges, whose story “The Garden of Forking Paths,” as translated by Boucher, appeared in the August 1948 issue of EQMM. That first appearance in English of a major figure in world literature remains one of the milestones in EQMM’s history of which we are most proud. I attended my first Bouchercon in 1989, before I was editor of EQMM, and before I knew anything about Boucher’s connections to the magazine or Ellery Queen. Anthony Boucher’s widow, Phyllis White, was sometimes at the conventions in those days, and I wish now that I’d known enough to ask her about her husband and his work for Ellery Queen. Bouchercons today are larger than they were when I started going, and it seems to me that there are fewer fans and more writers and aspiring writers than there used to be. That’s an impression, not something I could document, but one validated for me at this year’s short story panel, where the audience was asked how many were attending because they were readers of short stories and how many because they wanted to write them. Almost every hand went up at the call for the latter. Overall, the Cleveland Bouchercon was a high-energy affair, starting with the opening ceremonies Thursday at the Rock and Roll Hall of Fame, where toastmaster John Connolly rocked the crowd with his humor and moved the awards presentations along at a pace that pleased everyone. 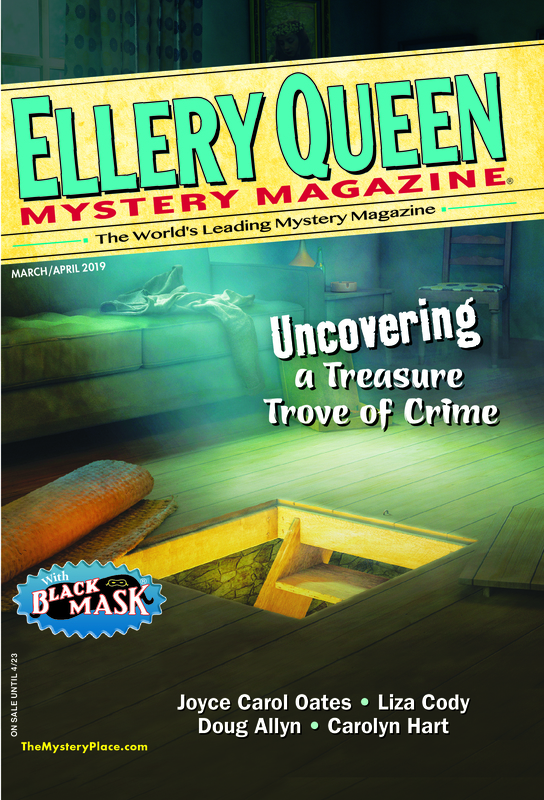 It was a good night for the Dell mystery magazines, with Jeffrey Cohen claiming the Barry Award for his story in AHMM, “The Gun Also Rises,” and Dana Cameron winning the Macavity for her EQMM story “Disarming” (available for reading on our Web site). Two Derringer Awards went to stories from EQMM: “A Drowning at Snow’s Cut” by Art Taylor and “Brea’s Tale” by Karen Pullen. A Friday of podcasting and panels wound up for me and my colleague from AHMM, Linda Landrigan, with a river and lake dinner cruise on the Nautica Queen with the Private Eye Writers of America, who presented the Shamus Awards onboard. EQMM had four nominees for the Shamus: Terence Faherty for “A Bullet From Yesterday,” Lee Goldberg for “Mr. Monk and the Sunday Paper,” Michael Haskins for “Vampire Slayer Murdered in Key West,” and Michael Z. Lewin for “Who I Am.” L.A. Wilson, Jr. completed the line-up of nominees with his AHMM story “Dancer in a Storm.” The Shamus went to Michael Z. Lewin. Hearty congrautlations to him, and to all of the other nominees! I wish I’d had time to tour more of Cleveland during the weekend but a full schedule, rain, and wind all conspired against it. Many people did seem to get out and see the sights, though, and thanks to the scouting of EQMM contributor Marilyn Todd and her husband Kevin I managed to see a little of Cleveland’s East Fourth Street neighborhood and dine with them at one of its restaurants on Saturday night—after seeing Dana Cameron win the Anthony Award for her EQMM story “Disarming.” Congratulations are certainly due to Dana: The Anthony is the third award her story has received! Bouchercons, when it comes down to it, are about conversations, and I was fortunate in having the opportunity this time to sit down with a number of EQMM’s authors, including Charlaine Harris, Toni Kelner, Dana Cameron, Jack Fredrickson, Terry Faherty and his wife Jan, Dave Zeltserman, Mike Cooper, Karen Pullen, Mary Jane Maffini, Terrie Farley Moran, new writer Suzanne Rorhus, and Josh Pachter and his wife Laurie. I’m leaving out many other EQMM writers whom I had a chance to see only briefly, but check out the websites of these few. If you’ve never been to a Bouchercon, it will give you an idea of the range of types of authors who attend this large and seemingly ever-growing convention. Who knows, maybe we’ll see you there next time. . . . This entry was posted in Awards, Conventions, Fiction, History, Writers and tagged awards, bouchercon, cleveland, conventions, elleryqueen, eqmm, fans, literature, stories, writers. Bookmark the permalink. Great post, Janet! One of the highlights of Bouchercon, for me, was the opportunity to spend some time with you and Linda. Your comments about the prevalence of writers and potential writers over fans reminded me of a comment from the very first Bouchercon, which Rita and I attended back in 1970. In a post mortem session at the end of the convention, one attendee, who I believe was a published writer of short stories, commented that the convention would have been so much more rewarding for the professionals if there weren’t so many fans around. One of the organizers, all of of whom came from the world of science fiction fandom, pointed out that if fans were not not allowed, he himself could not have attended. Another attendee suggested that while Anthony Boucher was a fine theme for the first mystery convention, the theme (and presumably name) of the 1971 convention should be something else. These two were assured that as long as the organizers had anything to do with the convention, it would be called the Bouchercon and fans would be welcome. The event has grown tremendously, but those two founding principals remain in place. Thanks for the great report and congratulations to all the EQMM and AHMM winners and nominees–and for that matter, to their wise editors. “…but those two founding principals remain in place.” And the principles do, too! I have to echo Karen. One of the great joys of Bouchercon Cleveland was getting to know you and Linda. I, too, am thrilled that there is such a resurgence of interest in short stories, since I love to both read and write them. The short story panel discussion was packed with folks and that is a great sign. I enjoyed meeting you too, Karen. Jon, I hadn’t realized that you attended the first Bouchercon. Very interesting that from the start, there was some talk of sidelining the fans in favor of authors and business people. I have the impression that fans remain more important at science fiction conventions than they are at most of today’s mystery conventions. I’ve never attended a science fiction convention, but my colleagues at the science fiction magazines have described them to me. Janet, you’re right, it was sometimes hard to find people this year, and I wish we’d had a chance to talk. I’ve heard that next year, in Albany, panels will take place at a location separate from the accommodation, so we may all be less likely to run into people. We’ll see . . . I was at the short story panel and enjoyed listening to most of what the panelists discussed. But now I wish I had opened my mouth and asked the one quetion I always want to ask when I’m attending any panel with writers – who were your influences and who among the past writers do you most admire. My blog is devoted to crime fiction of the past and celebrates forgotten mystery writers and books sadly consigned to the Limbo of Out-of-Printdom. I am always trying to get more Bouchercon panels on vintage writers, but every year there seem to be less and less. People have no idea what kind of exciting discussions can take place if they would take the time to pay homage to those who came before the current crop of writers. Believe me, there are several fans out there who know an awful lot about the history of crime and mystery fiction– some of them know more than Otto Penzler! But Bouchercon organizers seem only to recognize writers, agents, editors and publishers for panels over fans and bloggers. In response to Jon Breen’s astonishing report of a writer who wished the fans were gone from Bouchercon I’d like to point out that without the fans there would never have been THE ARMCHAIR DETECTIVE, HUBIN’S BIBLIOGRAPHY OF CRIME FICTION, THE CRIME CLUB COMPENDIUM, THE ENCYCLOPEDIA OF MYSTERY AND DETECTION or The Mysterious Book Shop which led to the creation of The Mysterious Press, one of the leading publishers of genre fiction still around today. I sometimes think some writers have no idea of the resources and inventiveness of genre fiction fans and how much they have done to preserve the history of crime fiction and help educate the public. Amen! I’d only add that at that first Bouchercon, that comment was an off-the-wall opinion that hardly anybody in the room shared. In fact, at that time, pros were very much in the minority. I doubt many professional writers would agree with it even now, but who knows?